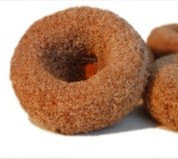 I buy a lot of organic frozen fruit at Whole Foods, and as luck would have it, I recently came across a box of Gluten Free Cinnamon Sugar Donuts in the vicinity (they must have been calling my name). I was super curious to look at the box, as I knew that I'd love to find a low calorie donut not only for myself to enjoy, but to share with you as well! I began to examine the box, where I found that the donuts inside were gluten free, wheat free (made from rice flour), dairy free, soy free and trans fat free. So far, so good! Sounded good, but I have to admit, I was scared to turn the box over, as donuts are notoriously high in calories and fat, and full of bad ingredients. So, I was pleasantly surprised when I saw that each donut only had 170 calories and 4.5 grams of fat, with no trans fats or other ingredients that I avoid. I knew it wasn't a slam dunk on the calorie side (especially weight watchers, since it is 4 weight watchers points), but these donuts seemed like a huge improvement over eating at a donut store, where donuts can be in excess of 300 calories and 10 grams of fat (and the unknown of not really knowing how many calories the donut really is, nor whether it has trans fats in it)! Plus, I figured I could substitute a donut for brunch on the weekend, when I usually indulge in 4 points of van's waffles anyway (for 230 calories which is much more than the 170 calories in the donuts). Or, I also figured having these in my freezer would give me something to look forward to at home if I saw a box of giant, questionable calorie donuts out at work (which happens all too often). You are probably wondering how big the donuts are. I'd say they are a pretty good size (not too big, not too small -- 45g to be exact). What is interesting about them is how dense they are. One donut is way more filling than 2 of the vans waffles I usually eat. Also, when I eat a donut, I automatically feel like I ate something bad (even if it wasn't), so I find that I tend to be less tempted by other things after I eat one. 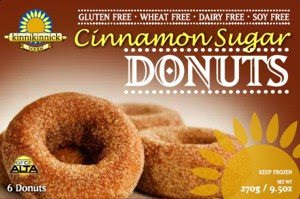 So, if you are looking for a lower calorie donut or have been looking for a gluten or wheat free donut substitute, these are definitely worth a try. They definitely aren't healthy compared to many other food options, but I think they are a fun and yummy indulgence for every once in a while. You can find these donuts made by Kinnikinnick in the frozen foods section of Whole Foods. Let me know what you think. I found them at Holiday Market and was excited, but I didn't have enough money on me to buy them along with the other stuff I was shopping for. How big is 45g? Like how comparable in size are these donuts to the ones you would buy at the bakery?